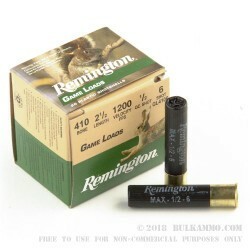 This 410 Bore shell by Remington features ½ ounces of #6 lead shot. That is a versatile shot size for small game, and depending on which choke you’re using you can take dove, quail, pheasant, rabbit, squirrel, raccoon, and even turkey with one of these handy shells in your shotgun. 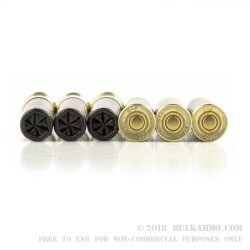 This shell offers a tight pattern that will keep it effective at distance, even for the relatively small amount of shot that a 410 Bore can hold. 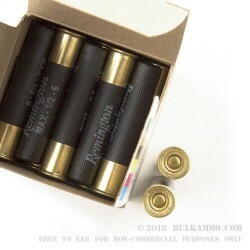 The second smallest shell commonly available, the 410 Bore’s similar size to the 45 LC cartridge means that you may fire it in revolvers including the Taurus Public Defender, Taurus Judge, and Smith & Wesson Governor. Whether you would use that pistol for self-defense, or just for a bit of fun with something different, is entirely for you to decide. 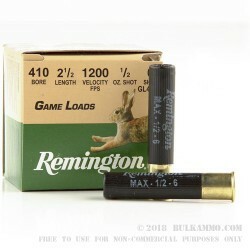 Remington’s Game Loads line of ammunition are intended especially for bird hunters, and are billed as having “bird-stopping surety.” They are built with the cost-conscious hunter in mind, although they in no way sacrifice the great quality for which Remington is renowned.